Some styles never fade, and some designs only get better with time. Our customers love our Old Friend Moccasins, styled from the finest deerskin and moose hide. Crafted with tradition, these shoes are a time-honored custom of comfort and luxury. Each handcrafted shoe provides the quality and value our customers have come to expect. 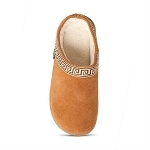 They look forward to the beautiful beadwork, embroidery or fringes on each pair of medium-width Old Friend Moccasins that they purchase. Whether you need traditional moccasins, slippers, slip-ons or ankle boots, our shoes are made for personal enjoyment and style. 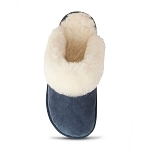 The soft sheepskin linings help keep your feet warm and dry while the padded foot beds provide a comfortable base for extended standing, walking or running about town. 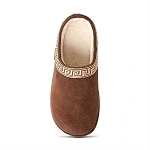 Our terrycloth moccasins provide comfort and reduce odor with our specially designed odor suppressant system. Many of our shoes are designed for indoor or outdoor wear. They come with rubber soles for secure footing in slippery weather and are lined with quality materials for additional warmth. 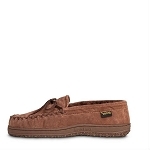 Discover the quality moccasins and shoes that many families have been enjoying for years. Find the right medium-width shoe in our large array of beautifully tailored and designed styles. Whether you need slippers for indoor comfort or dependable outdoor shoes, deciding between slip-ons, boots and loafers may be the hardest part. Join all the satisfied customers who love the enduring styles, 100% money back guarantees and great customer service. As a family-owned and operated business, we are committed to providing you with the quality we would give our own friends, family and neighbors.